The Listening Program is a fusion of beautiful art and sound science. The masterful performances of the award-winning players of the Arcangelos Chamber Ensemble are skillfully crafted using advanced audio technologies to provide an unrivaled listening experience. How can something that seems so simple - listening to psychoacoustically modified classical music - actually impact a wide range of abilities, such as reading, communication, learning and memory? 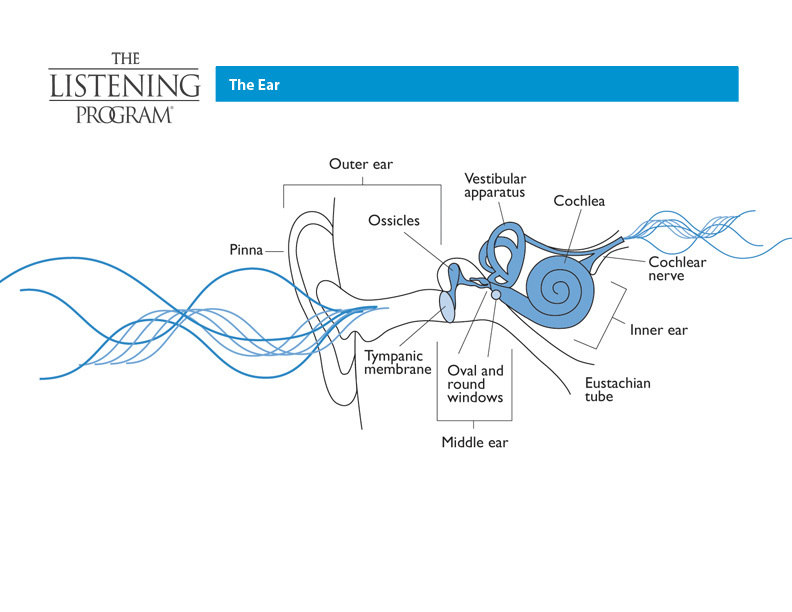 Numerous studies worldwide, including research at the University of Sheffield, provide empirical evidence that substantiate The Listening Program’s efficacy. And while that affirms The Listening Program’s credibility, for many the question remains, how does The Listening Program work? 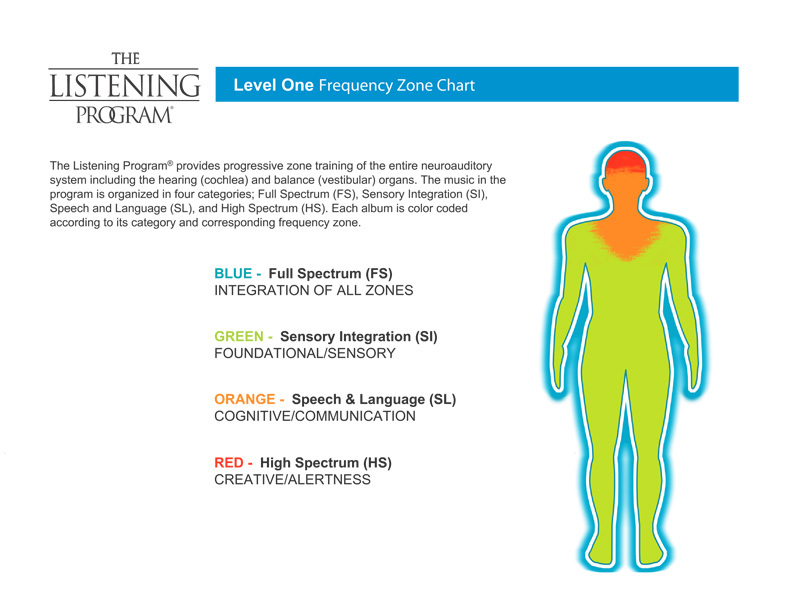 The Listening Program’s psychoacoustically modified music and patent-pending production techniques are designed to stimulate or “exercise” the different functions of the auditory processing system. This enables the brain to better receive, process, store and utilize the valuable information provided through the varied soundscapes in our lives such as music, language and the environment in which we live. So the question becomes...how can we overcome auditory processing challenges - moving from a “disorganized” to an “organized” system. Certain classical music, like that of Mozart, Haydn and Vivaldi, has specific structure, producing sound waves in organized patterns. Within these patterns are vital elements including time, frequency and volume. When listening to music, the ear is receiving the musical sound waves - waves that arrive in different frequencies, measured in Hertz (Hz). These frequencies stimulate the brain, and thus affect different functions of the mind and body. The Listening Program combines decades of clinical research in several fields, including neurology, physiology, psycho-acoustics, auditory processing, music theory and more. The method builds on the work of respected leaders in these fields, such as ear, nose and throat (ENT) physician Alfred A. Tomatis, M.D. (1920-2001). Among other discoveries, Dr. Tomatis helped identify the relationship between certain sound frequencies and their effect on their functions of the mind and body. A simplified explanation of Dr. Tomatis' findings shows that certain brands, or zones, of sound frequencies affect different abilities. 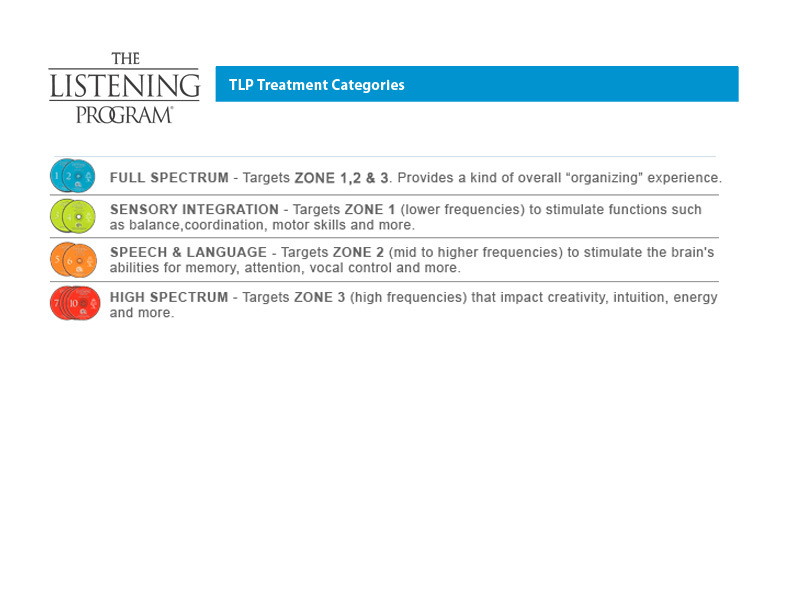 TLP is designed to address these zones, systematically providing auditory stimulation that, when customized for listeners by ABT Providers, can help improve their ability to function in a number of ways. THE BASIC BUILDING BLOCKS OF AUDITORY PROCESSING ARE TRAINED USING THE FUNDAMENTALS OF MUSIC - FREQUENCY, VOLUME AND TIMING. Listen to a sample of our extensive TLP music library. Use headphones for the best results, but note this short music sample is for demonstration purposes only. It will not produce the full effects of the high quality music you'll receive with The Listening Program.